During the heating season the outdoor heat pump coil surface will periodically accumulate frost. This is normal and to allow for continued efficient operation the heat pump will automatically defrost itself. This cycle generally takes 5-10 minutes and the system will return to the normal heating cycle after the coil is clear of frost. Occasionally some steam will be noticed coming out of the outdoor unit during the defrost cycle. This is normal. During the defrost cycle, the melt water from the coil frost, will run out of the drainage holes in the bottom pan of the outdoor unit and onto the ground. It is very important to check these drainage holes for leaves or other debris prior to the heating season. If there is debris it must be removed. This can be done by flushing with a hose and water or with a shop vac. If these openings are blocked and the water cannot drain properly there is a risk of ice build-up and possible coil damage over time. Also a drain pan heater is highly recommended to prevent damage. 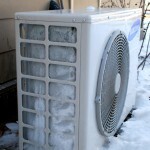 Want to know if a heat pump is right for you? Take the 17-sec Heat Pump Quiz and get your answer now! Heavier snowstorms can also create problems for the outdoor unit. After a snow storm the outdoor unit must be checked for blockage and if necessary the snow cleared from around and below it to minimize problems with airflow, proper defrost function and avoid fan motor/ fan blade damage. Sometimes warm water may also have to be used to melt away ice and snow that the defrost cycle cannot clear away. Always shut off power at your electrical panel or at the outdoor disconnect switch before performing this maintenance. If you need help with this or have any questions you should call your installer. Ductless heat pumps circulate the indoor air while also filtering it. To allow for maximum performance and to maintain proper airflow your filters should be cleaned every 4-6 weeks. To do this maintenance the front cover of the indoor unit pulls up to access the air filters. Pull the filters out and vacuum off the dust with a brush attachment or simply run them under a tap of lukewarm water. Do not use hot water as this may shorten filter life. Note: Make sure you lift the dust off the front of the filter rather than pulling it through the filter. This will ensure proper function of filter and maintain filter life. The above basic maintenance will help ensure reliable and economical operation of your heat pump and help extend the life of your unit.